COL Live 1st year Anniversary!! Concert2:15 pm sharp Kingston Avenue between Montgomory and Crown Street. 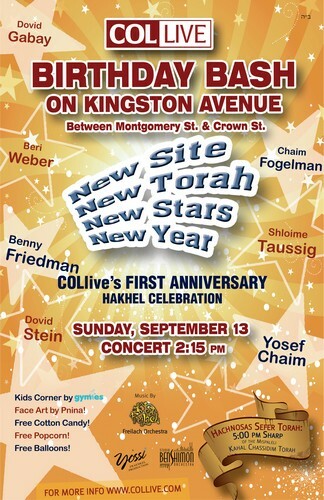 Hachnosas Sefer Torah5:00 pm sharp for more information log onto www.collive.com. Hachnosas Sefer Torah:5:00 pm sharp of the mispaleli kahal chassidim torah Obstacle course at gymies fun station! Face art by pnina! cotton candy! popcorn! gifts! fun for the whole family! Music by the Freilach Orchestra. Featured Performers;Benny Friedman, Dovid Gabay, Shloime Taussig, Berri Weber, Dovid Stein & Chaim Fogelman!